Scottish holiday cottages in Argyll don't come much better than those at Inverawe Cottages. Forget all the stresses of today and relax with a Scottish cottage holiday. Enjoy opening your front door and listening to the dawn chorus. Watch the roe deer sneak through the garden, the rabbits on the lawn. 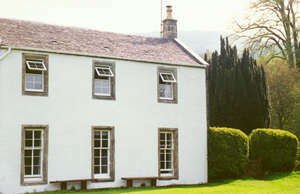 The three Inverawe Cottages are comfortable, cosy and welcoming. Ideal for a self-catering family holiday or fishing holiday. Fishermen staying in the Inverawe Cottages can go out early morning or late evening - in that way everyone is happy. These beautifully situated Argyll holiday homes are available from March to November. Lets are from Saturday 2.30pm to Saturday 10am. All you need bring is linen, towels and tea towels. This 2 storey cottage, with its own front door opening into the glass house, comprises 3 twin-bedded bedrooms and bathroom upstairs, kitchen/dining room, sitting room, with door opening into garden, and small hallway on the ground floor. This 2 storey cottage, with its own front door opening into the glass house, comprises 2 twin-bedded bedrooms and bathroom upstairs, kitchen/dining room, sitting room and small hallway on the ground floor. This delightful little crofter's cottage, near Loch Etive, really is the dream cottage to get away from it all. 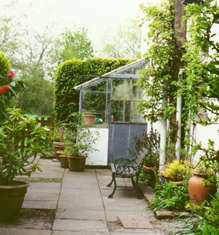 The cottage comprises sitting room/kitchen, twin-bedded bedroom and shower room. With a small storm porch and an adjoining outhouse with freezer, washing and drying facilities.